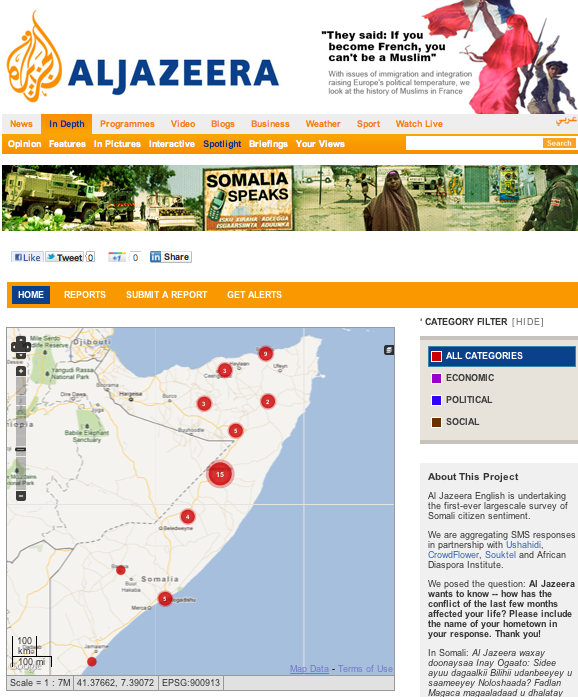 Somalia has been steadily slipping from global media attention over the past few months. The large scale crisis is no longer making headline news, which means that advocacy and lobbying groups are finding it increasingly difficult to place pressure on policymakers and humanitarian organizations to scale their intervention in the Horn of Africa. I recently discussed this issue with Al-jazeera’s Social Media Team whilst in Doha and pitched a project to them which has just gone live this hour. Al Jazeera wants to know: how has the conflict of the last few months affected your life? Please include the name of your hometown in your response. Thank you! So I reached out to my good friend Jacob Korenblum at Souktel. He and I had been discussing different ways we might combine our respective technologies to help in Somalia. Souktel has been working in Somalia and providing various SMS based solutions to several organizations. 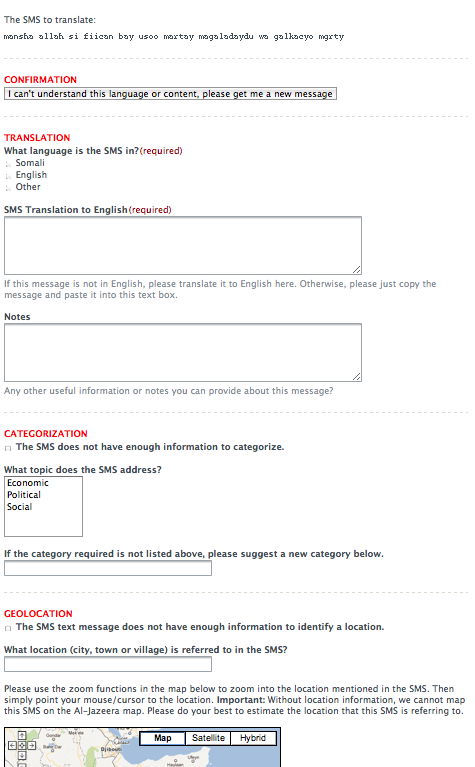 Jacob had previously mentioned that his team had a 50,000+ member SMS subscriber list. This proved to be key. Earlier this week, the Souktel team sent out the above question in Somali to about 5,000 of their subscribers. An effort was made to try and select geographically disbursed areas. They also wrote additional software so that text messages from Souktel could be automatically forwarded to the Crowdflower plugin which would then automatically push the processed SMS’s to a live Ushahidi map hosted by Al-jazeera. While the software development was moving forward, I connected with colleagues from the Somali American Student Association who expressed an interest in supporting this project. Thanks to them and other members of the Somali Diaspora, hundreds of Somali voices were translated and shared on Al-jazeera’s public Ushahidi map of Somalia within days. But we still need lots of help. So if you speak Somali and English, then simply follow this link. I wanted this project to serve as a two-way conversation, however, not just a one-way information flow from Somalia to the world. Every report that gets mapped on an Ushahidi platform is linked to public discussion forum where readers can respond and share their views on said report. So I suggested that Al-jazeera invite their viewers/readers to comment on the text messages directly. The next step will be for Al-jazeera’s editorial team to select some of the most compelling and interesting comments and to text these back to the senders of the original text messages in Somalia. This two-way flow of information can be iterated and scaled given that the technologies and workflows are already in place. “I was here, and this is what happened to me”? Use #SomaliaSpeaks to witness the project on Twitter. I want to specifically thank the following individuals who put an incredible amount of time and effort (most pro bono) to make this project happen: Robert Baker, Linda Kamau, Michael Moszczynski, Katie Highet, Jacob Korenblum, Vaughn Hester, Mohammed Dini, Hamza Haadoow, Andrew Jawitz and of course the excellent Al Jazeera team in Doha. Thank you all for going above and beyond to make this happen. This entry was posted in Crisis Mapping, Crowdsourcing, Digital Activism and tagged #SomaliaSpeaks, AlJazeera, Crowdflower, SMS, Somalia, Souktel, Voices, Witness. Bookmark the permalink. Thank you for your project of making Somali Voices be heard by the world. What you called as the Collective Witnessing , is as well a Collective Awakening both for the Somali’s as well as The World Community of Nations and Peoples , how the life in a small country can be affected . Take for instance the voice which says ” I work , live , and fish . We face problems forced on us by Nato Forces in Somalia also. ” [Name] , These words can imply that 1- Nato Forces can take fishermen and prosecute them as Pirates , from the 2- big European and Asian trawlers which fish illegally their sea , 3-the big ships which dump their toxic waste in the Somali Coast 4-Concealing thus the illegal practices of EU and Asian fishing companies . Fascinating to see the growth of your idea from conception to completion in this blog post. Innovative, awesome stuff that makes a difference.